Another long and hard winter? 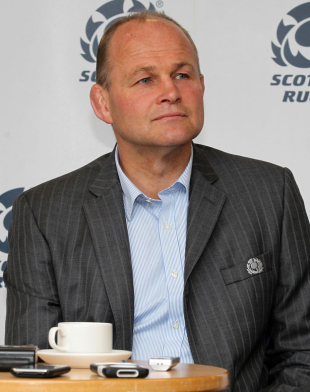 Andy Robinson and the rest of the Scottish management team will sit down some time in the next week or so, order a big takeaway and work out their starting XV for England come February 4. They will take several hours deliberating out their best forward pack, Ross Ford verus Scott Lawson, Al Kellock versus Jim Hamilton versus Fraser Mackenzie and Ross Rennie versus John Barclay? Do they start David Denton in the back-row or bring him off the bench? They have options, they have issues. After they have argued over the big men the selectors will take approximately 7 seconds to select the backline on the basis of last man standing. Not for the first time in modern history the Scots will have a very useful forward pack and a very average back line in the upcoming Six Nations. Robinson wants to play a quick, fluid, attacking, ball-in-hand style more akin to the Aussies than the Springboks but he's got to ask himself if he's got the personnel to do it? For years the Scots did alright by kicking the ball in the air and chasing it and some would argue that this big Scottish pack, Jim Hamilton, Richie Gray, David Denton, Ross Ford and Euan Murray are as big and powerful as anyone in the championship, can take England on up front in an arm wrestle and come away with the spoils. It doesn't happen often that the Scots outgun their ancient enemy up front but a glance at the likely line-ups come the opening weekend in February will persuade many that the Scots are bigger and more battle hardened than their English counterparts whoever gets the nod from Stuart Lancaster. So why not pick the tactical kicking genius Dan Parks, 34 in May, ahead of the running option of Ruaridh Jackson? Well, partly because the Cardiff-based Parks would hear the groans of disbelief all the way down in Wales; the Scottish public have never really warmed to the individual Aussie and never mind that there is a Test to be won. The Scots will feel that Parks is a step backwards and so he is but the alternative is Jackson (or a complete rookie in Duncan Weir) who's kicking game can be good but very often isn't. To highlight Robinson's woes the two centre spots may be filled by club wingers. The Scarlets' Sean Lamont, is a contender for the number twelve shirt and Joe Ansbro from London Irish is a live prospect for the outside centre slot because Graeme Morrison and Nick De Luca's form has been as patchy as a home-made quilt. Elsewhere the Glasgow teenager Stuart Hogg proved himself a very good footballer with a rare turn of pace against Leinster in the Heineken Cup but he also made two crucial mistakes that might have cost his side the match. Does Robinson really want a lightweight, teenage debutant at 13 patrolling the most difficult channel on the field to defend especially when he's spent most of this season playing fullback?
" And the elephant in the room is, of course, the Lions' post that Robinson's dismisses like a pesky fly every time the topic is raised but there is no doubt in most people's minds that he would sell his first born for a shot at leading the tour to Australia." It would be a high risk strategy and when the Scots hope to match (at worst) England's big men why take an unnecessary risk when a lack of options in the backs means you are taking several enforced ones? Well, partly because Robinson sees it as part of his task to move Scotland on, to adopt a more rounded rugby strategy, to win with total rugby. He has always had a good idea of how he wants his teams to play the game and it may be too much to ask him to turn his rugby philosophy on its head especially if only for a matter of weeks. In the back of Robinson's mind will the RaboDirect try machine that is Tim Visser. He becomes available for Scotland this June when the coach will surely want to move the ball wide to give his star winger a chance to show what he can do. And the elephant in the room is, of course, the Lions' post that Robinson's dismisses like a pesky fly every time the topic is raised but there is no doubt in most people's minds that he would sell his first born for a shot at leading the tour to Australia. To have any chance of coaching the composite team Robinson needs two wins (and preferably three) in the Six Nations which won't be easy. Scotland have won exactly one match in each of the last two Championship seasons. England are first up and at least there is a nice symmetry to the coaches Stuart Lancaster represented Scotland (at age group level) and Andy Robinson turned out for England in another era. It's not often you can say this but England might take time to adapt to a new coach after years playing to orders. They may just be a little vulnerable. Scotland hope so because they, and their ambitious coach, need to kick off with a victory or endure another, long and hard winter.